Proteinuria is an early manifestation of sickle cell related renal disease and considered to be a risk factor for developing renal impairment in future. ,, We have previously shown that some of the serious complications of SCD like pul­monary hypertension (PHT) and proteinuria are common in Saudi patients originating from the South and South-Western provinces, but their clinical significance and prognostic value is not known. , We conducted this study to identify any risk factors associated with proteinuria in adolescent and adult Saudi patients with SCD from the South and South-Western province in an attempt to study the patho-physiology of this potentially serious complication of SCD. Patients with SCD followed-up at adult hema­tology outpatient clinic, King Khalid University Hospital, Riyadh, were studied. These patients were originally recruited in a prospective study to identify renal abnormalities in SCD. Eligi­bility criteria included age 14 years or older and documented homozygous or compound hetero­zygous SCD. Patients were evaluated in steady state with no acute illness during two weeks prior to the assessment. All patients gave in­formed consent. Patients with sickle cell trait were excluded. Twenty-four hour urine samples were collec­ted to measure creatinine clearance and to quan­tify proteinuria. Details of the methods of urine sample collection for proteinuria have been des­cribed previously. Briefly, twenty-four hour urine sample collection was carried out from 8 am to 8 am next day according to the standard proto­col. Samples were analyzed for quantitative pro­teinuria and creatinine clearance. Protein excre­tion of more than 0.150 grams per 24-hours was considered abnormal. Clinical information was obtained from the patients' charts. All patients had blood extraction for measurement of hema­tological and biochemical parameters. Blood sam­ples were extracted within four weeks of urine sample collection. In some cases, blood sam­ples analyzed were taken more than four weeks apart from urine samples but an attempt was made to analyze samples collected only during steady state of the patients. The following parameters were evaluated for correlation with proteinuria: age, gender, systo­lic and diastolic blood pressure, hydroxyurea use for more than one year, total hemoglobin (Hb), hematocrit, white blood cell (WBC) count, platelet count, mean corpuscular volume (MCV), reticulocyte count, blood urea nitrogen (BUN), serum creatinine, level of sickle (HbS) and fetal (HbF) Hb, total bilirubin, alanine aminotrans­ferase (ALT), aspartate aminotransferase (AST), alkaline phosphatase, serum albumin, lactate de­hydrogenase (LDH) and serum ferritin. Patients were divided into two groups for analysis; those with 24-hour urine protein level above 0.150 gram (proteinuria group) and the second group with protein level of less than 0.150 gram per 24-hours. Statistical analysis for comparison of measure­ments was made using relevant tests with Sta­tistical Package for Social Sciences (SPSS, ver­sion 13.0) software. Subjects' data and different parameters are given as mean ± SD. A P value of < 0.05 was considered significant. A total of 69 patients with SCD were eva­luated. Two patients with nephrotic range pro­teinuria and renal impairment were excluded from analysis. The study population consisted of 36 females (53.7%) and 31 males (46.3%) with a mean age of 23.8 (± 7.2) years. The study group had a mean Hb level of 8.5 (± 2.8) g/dL and a mean fetal Hb (HbF) level of 14.4% (± 7.3%). Majority of the patients (n = 61) had Hb SS genotype and six patients had S-β0 thala­ssemia. Twenty-seven patients (40.3%) had pro­teinuria of more than 0.150 grams/24-hours. The mean age of the proteinuria group was 25.7 (± 8.6) years while that of non-proteinuria group was 22.2 (± 6.6) years. There were equal num­ber of males (51%) and females (49%) in the proteinuria group. The demographic, clinical and laboratory data of patients are summarized in [Table 1]. 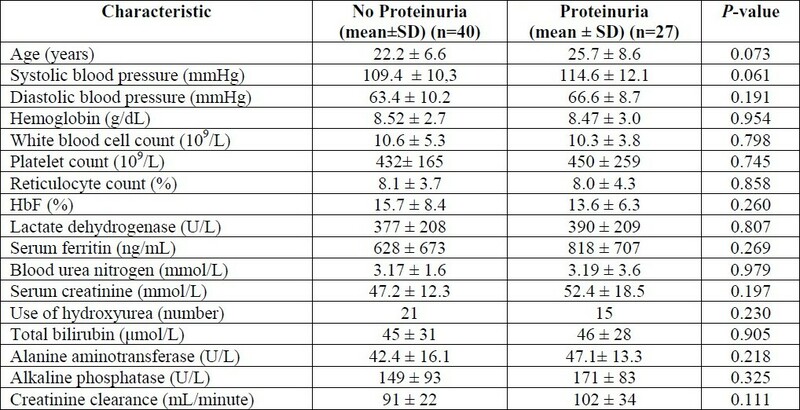 None of the parameters analyzed correlated with protei­nuria. There was a borderline association of pro­teinuria with older age (P = 0.073) and a higher systolic blood pressure (P = 0.061), which did not reach statistical significance. Table 1 :The demographic, clinical and laboratory data of the study patients. Fifteen of the 27 patients (55.5%) with protei­nuria and 21 out of 40 patients (52.5%) without proteinuria were taking hydroxyurea (HU) for more than one year at the time of assessment. There was no significant difference between different parameters in the two groups taking hydroxyurea, indicating no benefit of this com­pound (P = 0.23). When the patients with pro­teinuria were analyzed separately, there was no difference in the degree of proteinuria in pa­tients taking hydroxyurea in comparison to those not taking it (data not shown). Comparison of different parameters between the patient groups with and without proteinuria and the relevant P-values are shown in [Table 2]. Table 2 :Comparison of different parameters between the patient groups with and without proteinuria. The kidney is a frequent site of involvement in patients with SCD and renal impairment is a cause of significant morbidity and mortality in these patients. , Proteinuria is one of the most common and early manifestations of sickle cell related renal disease and patients with protei­nuria are at increased risk of developing renal failure in future. ,, As proteinuria in the early stages of nephropathy is associated with future deterioration of renal function, it is important to detect this early as intervention at this stage may prevent or delay the renal damage. In addi­tion, identification of any risk factors associated with proteinuria may also help in developing preventive strategies by attempting to modify some of these risk factors. We did not find any correlation between pro­teinuria and any of the clinical and laboratory parameters studied. There was a borderline as­sociation of proteinuria with older age and hig­her systolic blood pressure which did not reach statistical significance. Our findings resemble those of Aoki and Saad from Brazil, who also could not identify any risk factors associated with proteinuria. It is possible that the SCD in this group of Brazilian patients resembles the di­sease in our patients from south-western Saudi Arabia. Measures which may prevent or reduce protei­nuria/microalbuminuria after its development, include regular blood transfusions and angio­tensin converting enzyme (ACE) inhibitor the­rapy. ,,, Blood transfusions, for this purpose, cannot be recommended routinely because of the strong commitment required and the asso­ciated complications. Hydroxyurea has been re­ported to reduce proteinuria/microalbuminuria in children with SCD in conjunction with other measures in small studies, but does not appear to be very effective on its own. , We did not observe any benefit of hydroxyurea therapy for more than a year, in reducing proteinuria. ACE inhibitor therapy has an established role in preventing and reversing diabetic nephropathy and renal damage. ACE inhibitor therapy also appears to be an effective measure to reduce microalbuminuria/proteinuria in SCD, ,,, but long-term studies are needed to prove their effectiveness in preventing or reversing renal damage. In summary, proteinuria in adolescent and adult Saudi patients from South and South-Western Saudi Arabia is not associated with any clear identifiable risk factors. As microalbuminuria/ proteinuria usually start to develop during the second decade of life, all patients with SCD should be screened from early second decade and those found to be positive, should be con­sidered for ACE inhibitor therapy. 2. Bourke E. The kidney in sickle cell disease. J Assoc Acad Minor Phys 1992;23(11):41-5. 3. Thompson J, Reid M, Hambleton I, Serjeant GR. Albuminuria and renal function in homo­zygous sickle cell disease: observations from a cohort study. Arch Intern Med 2007;167(7):701-8. 4. Brenner BM, Meyer TM, Hostetter TH. Dietary protein and the progressive nature of kidney disease: the role of hemodynamically mediated glomerular injury in the pathogenesis of pro­gressive glomerular sclerosis in aging, renal ablation, and intrinsic renal disease. N Engl J Med 1982;307:652-9. 6. Guasch A, Navarrete J, Nass K, Zayas CF. Glo­merular involvement in adults with sickle cell hemoglobinopathies: Prevalence and clinical correlates of progressive renal failure. J Am Soc Nephrol 2006;17(8):2228-35. 8. Aleem A, Jehangir A, Owais M, et al. Echo­cardiographic abnormalities in adolescent and adult Saudi patients with sickle cell disease. Saudi Med J 2007;28(7):1072-5. 9. Aleem A. Renal abnormalities in patients with sickle cell disease: A single centre report from Saudi Arabia. Saudi J Kidney Dis Transpl 2008;19(2):194-9. 12. Wigfall DR, Ware RE, Burchinal MR, Kinney TR. Prevalence and clinical correlates of glome­rulopathy in children with sickle cell disease. J Pediatr 2000;136(6):749-53. 13. McBurney PG, Hanevold CD, Hernandez CM, Waller JL, McKie KM. Risk factors for micro­albuminuria in children with sickle cell anemia. J Pediatr Hematol Oncol 2002;24(6):473-7. 14. Dharnidharka VR, Dabbagh S, Atiyeh B, Simp­son P, Sarnaik S. Prevalence of microalbumi­nuria in children with sickle cell disease. Pediatr Nephrol 1998;12(6):475-8. 15. Faulkner M, Turner EA, Deus J, et al. Severe anemia: a risk factor for glomerular injury in sickle cell disease. J Natl Med Assoc 1995;87 (3):209-13. 16. Guasch A, Navarrete J, Nass K, Zayas CF. Glome-rular involvement in adults with sickle cell he­moglobinopathies: Prevalence and clinical correlates of progressive renal failure. J Am Soc Nephrol 2006;17(8):2228-35. 17. Ataga KI, Brittain JE, Jones SK, et al. Clinical and laboratory correlates of albuminuria in sickle cell disease. Blood 2008;112(11): 250-2. 18. Aoki RY, Saad ST. Microalbuminuria in sickle cell disease. Braz J Med Biol Res 1990;23 (11):1103-6. 19. Guasch A, Zayas CF, Eckman JR, Muralidharan K, Zhang W, Elsas LJ. Evidence that micro­deletions in the alpha globin gene protect against the development of sickle cell glomerulopathy in humans. J Am Soc Nephrol 1999;10(5):1014­-9. 21. Powars D. Sickle cell anemia: (3 S -gene-cluster haplotypes as prognostic indicators of vital organ failure. Semin Hematol 1991;28:202-8. 22. el-Hazmi MA, al-Swailem AR, Bahakim HM, al-Faleh FZ, Warsy AS. Effect of alpha thala­ssaemia, G-6-PD deficiency and Hb F on the nature of sickle cell anaemia in south-western Saudi Arabia. Trop Geogr Med 1990;42(3):241­-7. 28. Alvarez O, Montane B, Lopez G, Wilkinson J, Miller T. Early blood transfusions protect against micro-albuminuria in children with sickle cell disease. Pediatr Blood Cancer 2006;47(1):71-6. 29. Falk RJ, Scheinman J, Phillips G, Orringer E, Johnson A, Jennette JC. Prevalence and patho­logic features of sickle cell nephropathy and response to inhibition of angiotensin-converting enzyme. N Engl J Med 1992;326(14):910-5. 30. Aoki RY, Saad ST. Enalapril reduces the albu­minuria of patients with sickle cell disease. Am J Med 1995;98(5):432-5. 31. Foucan L, Bourhis V, Bangou J, Merault L, Etienne-Julan M, Salmi RL. A randomized trial of captopril for microalbuminuria in normo­tensive adults with sickle cell anemia. Am J Med 1998;104(4):339-42. 32. Fitzhugh CD, Wigfall DR, Ware RE. Enalapril and hydroxyurea therapy for children with sickle nephropathy. Pediatr Blood Cancer 2005; 45(7):982-5. 33. Alvarez O, Lopez-Mitnik G, Zilleruelo G. Short-term follow-up of patients with sickle cell disease and albuminuria. Pediatr Blood Cancer 2008;50(6):1236-9. 34. Kshirsagar AV, Joy MS, Hogan SL, Falk RJ, Colindres RE. Effect of ACE inhibitors in dia­betic and nondiabetic chronic renal disease: a systematic overview of randomized placebo­controlled trials. Am J Kidney Dis 2000;35 (4):695-707. Da Silva Junior, G.B. and LibÃ³rio, A.B. and De Francesco Daher, E.